One of Deb's Famous Belly Bears, this little gal is red hot! A great gift for any one that may be involved in a Red Hat group. Also great for a little girl that likes to play dress up. 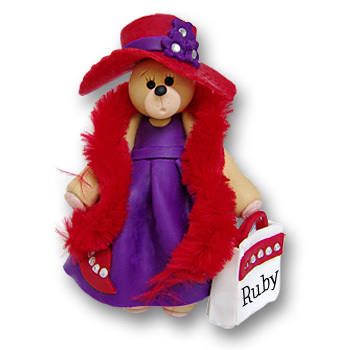 She is truly decked out complete with hat, malibou and rhinestones and ready for a shopping spree or lunch with the girls. Handmade from polymer clay and designed by Debi Allison. Comes complete with a hook and satin ribbon for hanging. She may be personalized FREE on her hand bag.